When I was a little girl, I believed absolutely in magic. As an adult, there are still times (although much more rarely) when imagination and reality can intersect at an angle just so, and the suggestion of magic reappears. For example, just imagine you’re helping to tend a garden one spring day, and you’ve been told there’s an 18th century well somewhere on the property. A beautiful stone well, dating to the time of the American Revolution, with the stones fitted together precisely in an elegant rock round, that is now blocked off by brush and in an uncertain location in the woods, no longer visible. Doesn’t it sound interesting? Wouldn’t you want to get a look? I did. I was told the general direction, and I headed carefully through brush, trying to avoid thorny catches on fabric and scratches on bare skin. I came across a log, as high as my knee around. I scrambled up to walk on it as a clearer path, and a vantage point from which to see, the heels of my flat-soled sneakers sinking slightly into the log as I stepped along it’s length, my step muted, the wood soft and golden, the bark long ago peeled away. At the end of this log, I found a medium-sized tangled tree bent half over, weeping branches mimicking its reaching and exposed roots, a mirror reflecting only itself. And stepping off the vantage point of my log and down to the earth, underneath that tangle of branches and to the side of those exposed wooden roots, the glimmer of a pool of water, bordered by carefully fitted stones. I edged through the tangle to get a better look, beneath branches and over roots, my hair catching on twigs, traveling on slippery root and wet earth, ending close to the edge of the well. The water high and close to the top, leaving most stones wavy below the shadow of branches on its glimmer-glass surface. An edge of fear, the possibility of falling in, down through the water and down through the collected silt and into the unseen, like Persephone. Close to the edge of the water, just as I was considering the depths and the probability of my fears, I spotted a pile of feathers. Yellow and black, striped cream and grey. No beak, no claw, no bone, no tendon, just the feathers in a neat pile, and a large pile at that, an entire bird’s plumage. A costume change (if this were a fairy tale) or the remains of a feast by hawk or fox or other small beast. What it was, I think in retrospect, is the confluence of earth, water, and air in a magic afternoon: a garden in Vermont, a walk through the woods and along a log, dappled sun on water, under the blue sky reflected in an old well, and a pile of airy feathers. 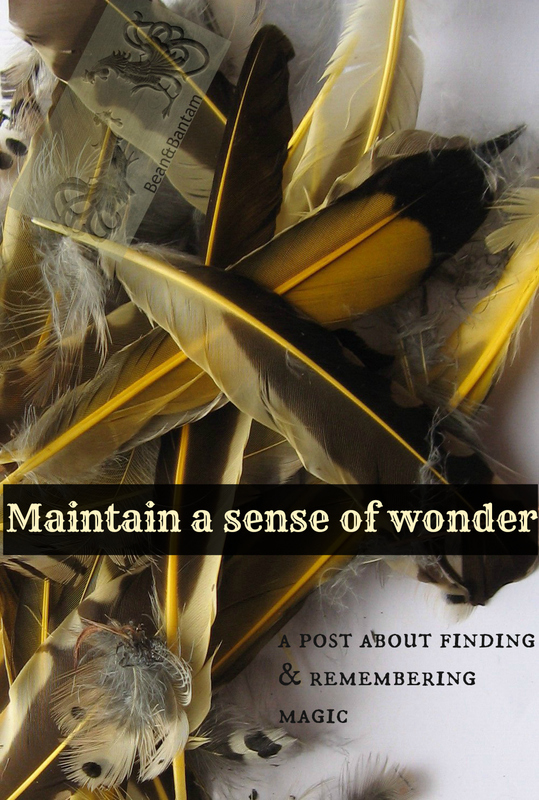 Maintain a sense of wonder: a Bean and Bantam post about finding and remembering magic. Daphne, your post today is as lovely as it is mysterious, and leaves me wondering if your well was really there or if it exists in your imagination. Also, you’ve hooked me. I never read Fire and Hemlock. I perused a few reviews at Goodreads and now I want to! Yes, I wondered if I should specify that it’s a true story. It’s a real well; this happened a few summers ago in Arlington, Vermont. This has got me remembering all the magical stories I loved. I reread lots of them every few years. Ronald Dahl is one of my favorites too… I share a birthday with him. I will check out Fire and Hemlock! Loved this well story, the way you described it, I can picture it perfectly….I wonder if you were tempted to make a wish and toss a stone down into it? Sounds like an amazing experience. Once, when we went camping in the Napa Valley, we kids discovered a Victorian-era cemetery right near the camp site. It was spooky and wonderful. That does sound spooky and wonderful! Well done Daphne! I really like your style. The truth well-told is often better than fiction. James and the Giant Peach…Now there’s a good one. Those are wonderful book choices that exemplify the magic world. Another one that did so for me as a child was “The Borrowers.” I loved that one. Yes, definitely the Borrowers! I had forgotten about them until you brought them up, will have to hunt up a copy, thank you! That wasn’t meant to be anonymous. Learner driver! To a magical, thrilling day! I love imagination. It’s essential to life. And when I was a child, I longed to fly. Sometimes I still do, too. Thanks for visiting and liking my blog. I will get you an address if you’re interested in donating used clothing to the children here at the border. This is incredible! I completely agree with your believing in a little bit of real-life magic. I’ve added some of your recommendations to my book list! I’m trying to read at least one “fun” book a month and now I have so many more options (that are actually fun)! Thank you for sharing! You are welcome, and I hope you enjoy reading!